Haitian Christian Mission has taken drastic measure to bring awareness to a sustainable way of serving. It is not only about food and water, although these are much needed. We are implementing new thinking by training, teaching, and encouraging people to take ownership of their ministry, community, and homes. We are and will continue to invest in our staff and people. Although the Haitian economy is a hindrance in bringing this philosophy to reality, we have seen much progress in the Haitian people taking ownership of their endeavors. Teaching is always at the forefront of the ministry. HCM continually trains its churches and schools leaders, teaches students, and trains young adults in translation, trades, and professional services. This dedication to educating individuals has helped many find jobs in non-profits, schools, hospitals, and government. Others start their own business. And still others return to HCM to work for the mission. Our goal for the future is to keep training leaders to assume more responsibilities, to strengthen the ministry and to bring a unified and educated front in facing the enemy of our souls. These projects will help us keep Haiti sustainable today, and help us fight towards a better Haiti tomorrow. One out of every three children under the age of five in Haiti has stunted growth and brain development due to malnutrition. Six out of ten are anemic. Malnutrition is the leading cause of death in children in Haiti. Some 55% of Haiti’s 9 million people live below the poverty line of $1 US a day. Natural disasters, political upheaval, unemployment, and high food prices all make finding enough food to feed their children nearly impossible for many parents. Every week Haitian Christian Mission works to help meet this most basic of needs for the people it serves in Haiti. School children in the HCM schools that have sponsorship programs receive a hot, fresh lunch each day. As we are able, we distribute rice, beans, oil, peanut butter, and other staples to desperate families in rural Haiti. Our peanut butter factory is made on campus in Haiti and is distributed to people in need and will be sold in stores. We were inspired to create this peanut butter factory as a way to supplement the feeding programs in our schools and also as a method to fight severe malnutrition in young children. There is no malnutrition treatment center in the southern region of Haiti, so we felt a huge need for this factory and program. In addition to the nutritional benefits of peanut butter, having our own factory creates jobs for locals and brings in revenue that will fund our malnutrition program. We started by giving 50 malnourished children 2 kg of fortified peanut butter a week and measured their progress. This type of peanut butter has been proven to be able to revive children suffering from severe malnutrition, and we hope to bring the same results to our communities. The HCM Peanut Butter Factory is functioning and growing quickly. The factory is being managed by Gietchen Bruny Dorlus and it now employs five people. 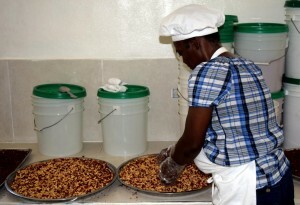 Currently, the factory produces 120 jars a day using all Haitian-grown, quality-tested, organic peanuts. The peanut butter produced will be used in the HCM school lunches, sold to churches and communities, and also sold in the US. The money earned from US sales will be invested back into the factory to finance the malnutrition program run out of HCM’s Christ for All Hospital. Our FIT Butter will be sold at the Giant Supermarket in Haiti soon and we are preparing for that so that we can continue to distribute our Peanut Butter and FIT Butter across the nation. We are working with the Partners in Health hospital and peanut butter factory in the northern region to develop our fortified peanut butter product and to research its use in fighting malnutrition. We have been training our doctors and staff, led by Dr. Dieunord, in this form of malnutrition treatment. The woodworking shop at HCM is run by Boss Charles. This shop produces benches for our churches and schools, creates other items for the campus (stages for events, tables, doors, etc.) and builds furniture to sell. Over the years, Boss Charles has had many apprentices who have learned the skill of woodwork under his instruction. He has recently opened a class of over a dozen young men eager to learn the trade. Visiting teams often work alongside Boss Charles and the others in the woodworking shop to help with building projects. If your team is interested in helping build benches or other projects, contact us to learn more about the current needs. In conjunction with our Woodworking Shop is HCM’s Construction Ministry. After the earthquake shook Haiti on January 12, 2010, over a million were left homeless in Port-au-Prince and among them were many members of the HCM staff including doctors and pastors. Alongside our long-time partners IDES and FAME and amazing financial supporters all over the world , we were able to move many families out of the temporary tent cities and into permanent homes. Haiti was struck again in October of 2016, this time by Hurricane Matthew. Our needs assessment found 56 homes and 1 church within our communities in need of being repaired or rebuilt. The construction ministry team has begun repairing and rebuilding these homes. The estimated cost for this project is $6,000 per home. If you would like to support this rebuilding effort, you can do so here. Churches and schools are also growing in Haiti. This growth is both amazing and challenging. Churches around the world are invited to partner with a specific community and help them meet the needs of their communities. Click here to learn more about church partnerships. Our construction needs are constantly changing as we respond to direct needs. Whether we are providing a family with a new home, helping a pastor fulfill his vision to serve, or building a warehouse for food storage, we look to God to provide. We are grateful for all of the faithful support from those with a vision to help with our building efforts. The HCM Superior Institute of Translation and Interpretation / Institut Supérieur de Traduction et d’Interprétariat (ISTI) trains and prepares its students to work as interpreters by giving them the necessary skills and knowledge in language, culture, and computers. The students dramatically increase their hire-ability with proficiency in English. After completing the 4-year program, the students are well equipped to work as interpreters and translators for organizations all across Haiti. Several students from the program have gone on to work for HCM interpreting for our visiting teams or translating items such as student letters and documents. We have an English sponsorship program that allows donors to support our translation students. This sponsorship pays for the student’s tuition, books, and necessary materials and also goes towards funding the institute as a whole. The English Sponsorship program helps these aspiring students by enabling them to get the training which will allow them to provide for themselves and their family in the future. If you would like to support a translation student for $35 per month, email us at sponsorship@haitianchristianmission.org or you can support the institute by designating your online gift or mailed check to the translation school. We also have opportunities for visiting teams to assist in our English classes or lead teacher training clinics. If you are interested in serving in this way, please email kristen@haitianchristianmission.org. Because every woman deserves a chance to have a better life. Haitian women are hard-working, talented, and very business minded. But too often, they lack opportunities to earn an income to support themselves and their families. 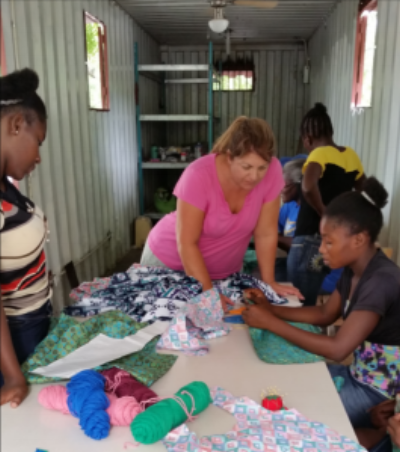 Sisters Helping Sisters is a women’s ministry which provides such opportunities to women in the cities, mountains, and remote areas of Haiti. Sisters Helping Sisters is a microloan program that helps Haitian women start their own business as a vendor, artisan, or other trade. The program also supports the ladies in their parenting, marriage, and community life. As an individual, a Sunday school class, or a women’s group, you can be a Sister helping a Haitian Sister and provide the financing for a low-rate loan for her to start a small business. Typical start-up cost is $250. From this, 10% will go toward the HCM general fund to support the mission as a whole, 10% will pay for administration fees, and 80% will be directly invested in a Haitian woman’s small business. The recipients repay the loan at the rate of 2% monthly. Loan payments are invested back into the program, building the payer’s business or, when the business becomes self-supporting, financing another woman’s business. The Haitian ladies need your prayers and your partnership. Together we can help each woman and her family create the kind of life every human being deserves. God bless our sisters in Haiti and around the world. Unemployment in Haiti is high, just over 40%, with rural area unemployment rates estimated at 80-90%. High unemployment often leads to undesirable outcomes such as higher crime rates, negative public health outcomes, and systemic poverty. Fonds-Parisien is an area where unemployment and lack of income hinders residents from purchasing food, clothes, and supplies, and from paying for transportation, school tuition, and health services. The sewing program allows us to create jobs for local women, teach useful skills enabling them to find employment elsewhere, and promote sustainable change in the community. Goals for the HCM sewing program? The HCM Sewing Program will eventually include a sewing school where local women can learn a set of technical and practical skills that can lead to employment and an income. This school will also provide 10-15 students with sewing training and a certification of completion at the end of the program. The program will also run as a business selling baby and woman products. Two of the main products of our brand, Meesh Meesh, will be quality cloth diapers for sale and reusable feminine hygiene products for distribution to girls and women in village communities. The Sewing Center will initially create 2-3 paying job positions; however, as the project grows and enters the business phases, 10-15 new seamstress positions and 2-3 managerial positions will be created, bringing new potential employment opportunities to HCM and Fonds-Parisien. Once established, the profit from the sales of Meesh Meesh will sustain the school and the business. What is HCM's current sewing program? Currently, HCM has a small sewing studio that allows for a few ladies to come in and work on projects. Occasionally, we have visitors come from Washington state to teach sewing techniques and new designs to our ladies. But we dream of so much more! Will you partner with us to help get this program into a real building where we can expand and develop a full sewing program? You can help us make this school and business a reality for Fonds-Parisien. We are asking you to please consider giving a gift toward the construction of the sewing center and the establishment of the school. Your investment will help create jobs, teach valuable skills, and promote sustainable living in the Fonds-Parisien community.